Jane Chapman is a multi award-winning artist who has illustrated over one hundred books including five New York Times bestsellers. She lives in Southern England with her husband, Tim Warnes, two children and five chickens. 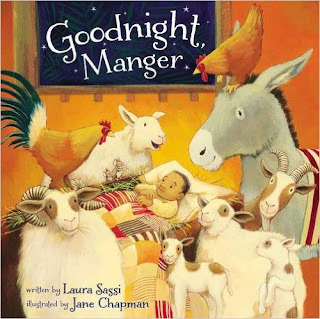 Goodnight, Manger by Laura Sassi is a wonderful board book for kids! In Goodnight, Manger by Laura Sassi kids will be delighted with sweet, rhyming text and beautiful illustrations throughout. My family and I love the unique twist on the classic manger tale and how wonderfully appropriate this book is for bedtime! In Goodnight, Manger by Laura Sassi Mama finds a way for everyone to work together to shepherd Baby Jesus into peaceful dreams under the twinkling stars. Each and every night this week my kids have asked to read this book before bed and it truly does seem to help settle them down and help prepare them for sleep. Goodnight, Manger by Laura Sassi is a fabulous book and I'm sure your family will enjoy it just as much as my family does!